Adapting video game into an anime (or well, to any visual medium like tv series or movie, really) has always been a tricky business. There’s usually two, most often used, ways to do this. Either stick close to the narrative of the game or branch out to create its own narrative using the game as a foundation. God Eater anime is more or less in a weird compromise between the two methods. The anime only covers about half of the game storyline (I’ve played the game before watching, pretty much the only reason I’m watching this) while adding in its own several ideas. The overall result of that is….interesting. God Eater is underdeveloped and uneven in many parts, but it certainly has highs. I’d say that’s already more than most anime could do. The series set in a distant future where a mysterious monster called Aragami has overrun the entire world. Fenrir was established to combat these Aragami through the use of the God Eaters, chosen individual with the capability to use the God Arc, the only weapon to kill Aragami. Our main protagonist, Lenka, is the newly recruited God Eater for Fenrir’s Far East branch, formerly known as Japan. Lenka’s determined to kill Aragami, but soon find himself struggling with his own simplistic desire and his incapability to protect everyone. One of the main element of God Eater is the parallel between human and Aragami. Aragami came to existence through Oracle Cell. A newly discovered biological cell that’s capable of evolving through devouring other cells, both organic and non-organic. In response to the ever-evolving Aragami, mankind similarly evolve. God Arc was also created with Oracle Cell, essentially making it a human-made Aragami, which resulted in it’s wielder, the God Eaters, to become more than human, but human no more. Fenrir only sheltered those who are capable to become God Eaters, and their families. Through the conflict between human and Aragami, it’s clear that God Eater was trying to evoke the theme of “Utilitarianism vs Humanism” in which for the sake of humanities survival, sacrifice of the few must be made. But in doing so, there’s also the question where how many sacrifice we made for the sake of collective good before we entirely lose what made us human to begin with? But, Aragami also function for another metaphor, the general idea of “evil” and, to some extension, death. Aragami is a mindless monster that mysteriously appeared out of nowhere and attack indiscriminately at any time, but it’s also monster that, as revealed later on, cannot truly be extinguished. For every monster that was killed, their remaining Oracle Cell can always regroup itself again to create a new. Characters struggle with the ideas above in varying degree. Lenka vague and simplistic desire/resolve to become God Eater render him incapable of protecting anyone and almost made him giving up on his own life in the process, all the while struggling with the fact he can never save everyone. With the guide of his unit leader, Lindow, a man who acknowledge the tragedy of the world, but nonetheless strive through it in his own way (like providing a safe haven for those who can’t get into Fenrir), and the very people that he tried to protect, Lenka found a new resolve. To inspire and guide others, something he does later on with his comrade such as Alisa, a God Eater transfer from the Russian branch who’s coping with trauma of losing her parents to an Aragami (and in her effort to suppress her fear, almost made her gave up on her humanity), and Soma, another God Eater who struggle with his identity as the first God Eater ever conceived and the fact that his birth is at the cost of his mother’s life. Lenka’s renewed determination more or less becomes God Eater thematic (the second one, at least) conclusion , you can’t never truly extinguished “evil” or misery in the world, but you still have to fight for a better world and passed on that hope to someone else. God Eater’s delivery of it’s ideas can sometimes be less than graceful, but the series knows when to hammer it’s message home and when the story needs a breathing room or delivering moment of horror, cruelty, or triumph. 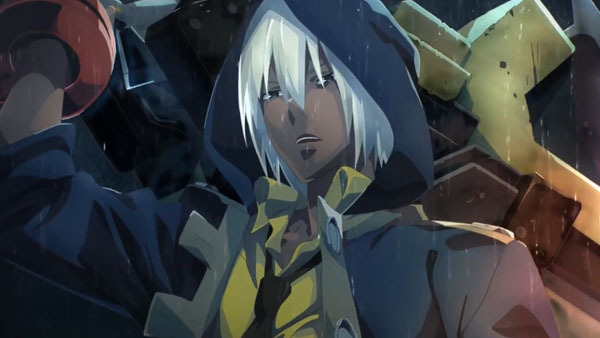 Apart from the present-time narrative, God Eater was also peppered with flashbacks from before the apocalypse happened, chronicling the struggle of Johannes, the current Far East branch director, as he witness the subsequent birth and rise of the Oracle Cell. The flashback allows for some nice parallel to the present-time narrative, and serves as another articulation of God Eater’s overarching theme. God Eater’s core problem lies in the risky narrative decision that was made by the creative team. In the pursuit of fully articulating solid core ideas, several character’s arc lacks the pay-off that they should have. Arcs for characters such as Soma and Alisa are missing several key emotional beat in order for their emotional development to truly resonates. Alisa’s PTSD problem for example, which was build up over the course of few episodes, ends in a matter of minutes through a loud pep talk. Soma’s character arc also suffer the same fate with even less build-up. Plus, it’s attempt to also adhere to the original game’s story in limited episode count resulted in unfinished overarching storyline. A likely deal breaker since second season is unlikely due to low viewership, sales and delays because of troubled production. Aesthetic-wise, God Eater more or less shine. The post-processed visual allows for not only a distinct grim apocalyptic look, but also made the CG-rendered Aragami to blend in quite well with the environment. The action is also flashy and well executed as expected of Ufotable production, although the dynamic camera movement sometimes can makes it a little unclear what action the character was doing. The music done by Go Shiina was also a standout with diverse range from harrowing choir to fist-pumping rock guitar during peak action moment. So on the whole, despite rough edges, I came out liking God Eater, more than I expected at the very least. It took a couple of episodes for me to be completely invested on the going ons in the story, but I’d say its worth it. While the overarching storyline isn’t complete, God Eater, for me at least, is kind of one of those stories where it’s actual narrative is incomplete, but thematically it does. Not for everyone, but I have a good time. Recommended. I can’t really say that I recommend the original game though. For the most part, it was a Monster Hunter knock-off, plus the structure of the game doesn’t allow much for truly hard hitting emotional moments and character development.